All of us Utah designers were asked to put together a doll block using a doll template they sent to us. All of the blocks are going to be put together into one or two quilts and will hang in the Riley Blake booth during Market. While you are at Market you will go and find all of the designer's booths and get a stamp or something - then you will be entered into several drawings for great prizes. Even though I won't have a booth - I was still invited to make a block because I live in Utah and I am a designer. The red hair - I would totally have red hair - I did once and I loved it, but it's not that easy to keep up and my sister Abby lives in Salt Lake and she is the one that does my hair. The skirt was strip pieced - which is another staple in my quilting diet - I love how fast and easy strip piecing is and so of course I had to have that in my block. The shoes are green - I love green if you haven't guessed and so my favorite color was represented in my shoes. Everything was machine appliqued using a satin stitch - again, the only way I applique - fast and easy is my motto because I don't have a whole lot of time. Well - I hope you enjoyed my block - be sure to look for it at Market in the Riley Blake booth. If you are going - look for me because this will be the first year I am going - my first Market experience if you can believe it. 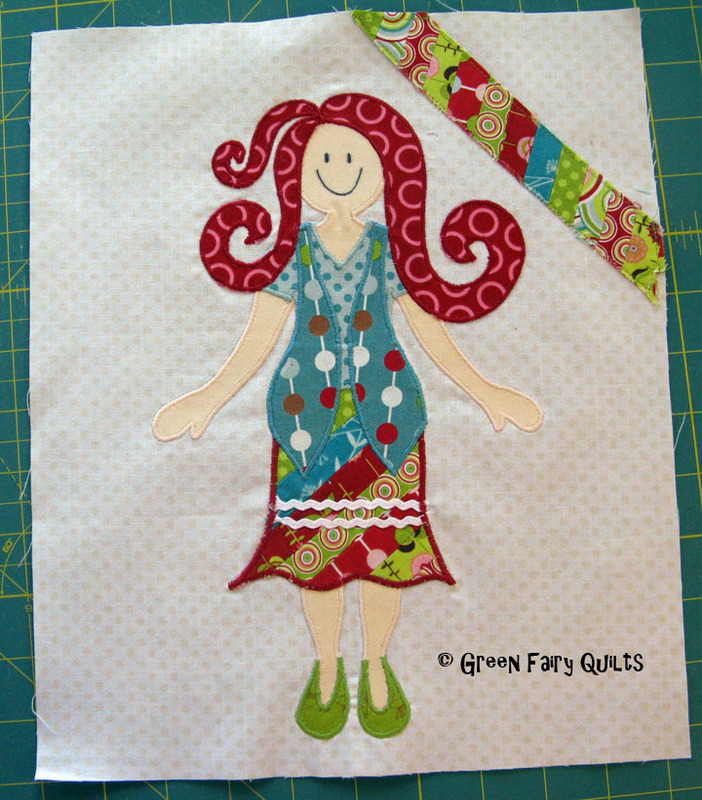 I am going to abandon Clint and the three oldest and come and hang out with the quilting world! I am so excited. I am also going to be going to this - can't wait! Oh - and anyone wanting to make the doll quilt - the instructions for each designer's block will be added to the blog so go follow the blog and you will get all the updates from Amanda. I did enjoy your block and we are kindred spirite, I have always wanted red hair, I wanted a child with red hair....but not in the cards or genes...HA!! Ha, Ha, love it very funky and cool. I think the stick figure smiley face looks perfect and anything else would have looked out of place! Wish we could ALL get these LADIES patterns so then quilters world wide could enjoy! Your doll is adorable Judi, you did a fantastic job on her. I've seen Lila's and Amanda's dolls so far and they will all fit together just perfect in a quilt. I want your "baby birthing hips"! Ha! Can anyone go to the quilt market, and look around?